Lexington KY – July 26, 2012 – Thunderstorms plagued the Kentucky Horse Park as riders gathered beneath the lights of the Rolex Stadium to compete in the $25,000 Hagyard Lexington Classic at the Kentucky Summer Horse Show. Paige Johnson proved to be the best of the best, controlling the jump-off with one of only seven double-clear efforts aboard Chiron S to lead the victory gallop. 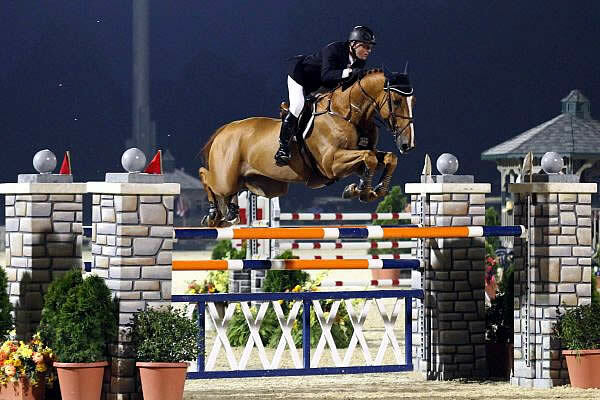 Shane Sweetnam and Danielle Goldstein also tackled the short course, but their times could not catch Johnson’s speed, each placed third and fourth, respectively. Marin Zevedo designed tonight’s course, using obstacles such as a vertical-oxer-vertical triple combination, bending lines, an oxer-oxer double combination, a triple bar, roll backs and tight turns. 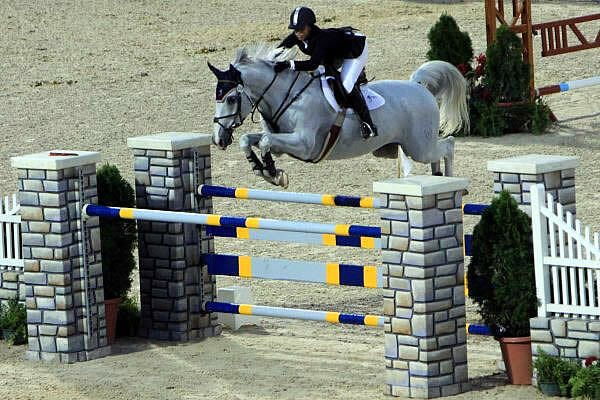 The jump-off allowed 47 seconds for horse and rider to break the beam, using a serpentine path to guide them to the finish. Starting over the first oxer and making a right to a vertical, riders then took a standalone red-and-white vertical to the oxer-oxer double combination. Upon landing, they were in full gear, racing against the seconds as they maneuvered over the SSG Digital Riding Gloves vertical and finished over the final oxer. McLain Ward and Pjotter Van De Zonnehoeve won the $25,000 Hagyard Lexington Classic at the Kentucky Summer Horse Show. Photo By: Rebecca Walton/PMG. Lexington, KY – July 28, 2011 – It was a late night at the Kentucky Horse Park as riders gathered at the Rolex Stadium to compete in the $25,000 Hagyard Lexington Classic at the Kentucky Summer Horse Show. McLain Ward proved to be the best of the best, dominating the jump-off with the only two double clear efforts aboard Pjotter Van De Zonnehoeve and Vocas to place first and second, respectively. Ashlee Bond and Shane Sweetnam also tackled the short course, but with four faults each they placed third and fourth, respectively. Tonight’s class was the third of seven grand prix events that make up the Hagyard Challenge Series, sponsored by Hagyard Medical Institute and presented by Pfizer Animal Health. Following the final event in the series, a cash prize of $45,000 will be awarded to the rider accumulating the most points throughout the series for the Leading Rider Bonus. Twenty-seven riders competed over tonight’s first round designed by Richard Jeffery of Bournemouth, England, which featured an open water with a scored lath and pole, a oxer-vertical double combination, and an oxer-vertical-vertical triple combination. Only three riders were able complete the technical track without fault and advance to the jump-off. The short course began over a single oxer to two single verticals, a second oxer, the first two obstacles in the triple combination, and finished with a gallop over a large oxer near the gate.